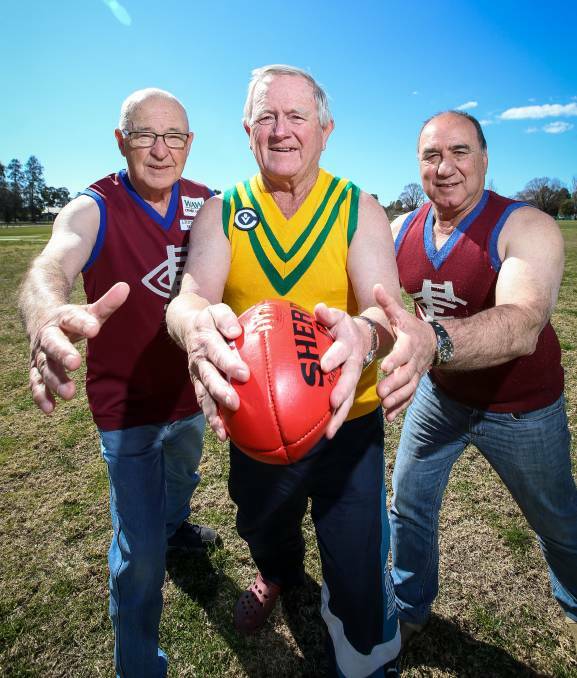 Few understand the rivalry between Holbrook and Culcairn quite like Peter ‘Bull’ Wornes. The reason – he’s had a foot in both camps. While Wornes has been a player or trainer with the Brookers for almost 60 years, his only senior premiership came at Culcairn in 1968. “I’ve been on both sides,” Wornes said. “I went over to work for Jack Smith at Pitman and Company when I was younger and had three years at Culcairn. It seems not everyone shared his view. Wornes vividly remembers the first time he came up against his home club early in the 1968 home and away series. “They didn’t muck around,” he laughed. “My brother Frankie was pretty happy to give it to me and my brother-in-law Johnny Semmler got into me as well. 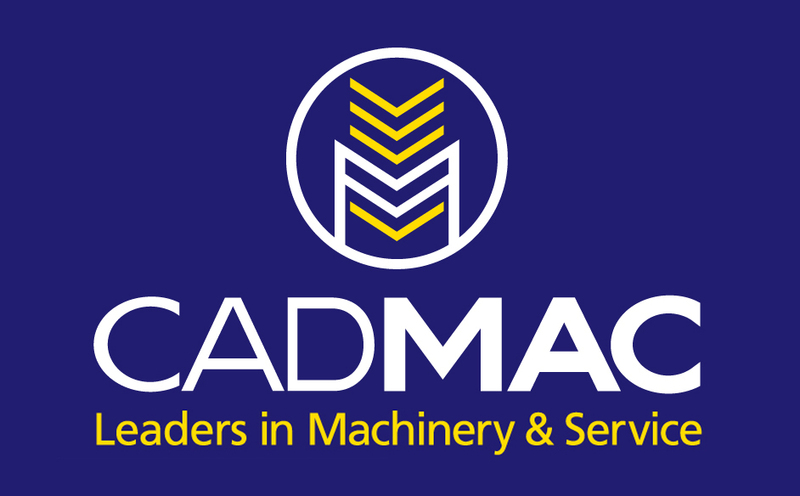 “’Macca’ (John) McKenzie’s a good mate and he was there too. To make sure Wornes never forgot about his time at Culcairn, a prankster later gave him a football jumper made up of Culcairn and Holbrook colours. Culcairn and Holbrook’s rivalry has continued through the Albury and District, Farrer, Tallangatta and District and Hume leagues with another chapter to be written when they clash in the first elimination final at Walbundrie on Saturday. Culcairn stalwart Jimmy Lee, who remains good mates with Wornes through their passion of lawn bowls, said a clash between Lion Paul Schultz and Holbrook’s George Hill in 1968 was etched in his memory. “It typified the rivalry,” he said. “The ball was between Paul Schultz and George Hill and they both went for it. “That was the typical of the see-ball, get-ball mentality in Culcairn and Holbrook games. “If the pig skin was there, you had to go for it. “It was pure aggression at the ball. The sickening head-on collision resulted in play being halted for 10 minutes with Schultz and Hill suffering head wounds. Schultz had to be taken to hospital in a doctor’s car. Lee recalls being at the centre of controversy in one match against Holbrook. “I went right off the air one day,” he said. “They were all big games and I was bitten on the back in one of them. “Nobody knew why I was going berserk. “We had a laugh about it after the game. While some say the establishment of Billabong High School in the late 1970s has softened the rivalry, neither club still likes to give an inch. Like Wornes, Culcairn stalwart Frank Ravenna’s only senior flag came in 1968 in his first year of senior football. 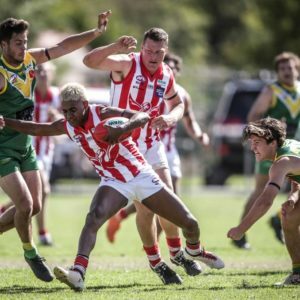 They defeated Lockhart in the grand final at Yerong Creek. Ravenna said the Culcairn-Holbrook rivalry had always been a talking point. “It’s been there for years,” he said. “I remember it going back to the under-16s in the Farrer league. Ravenna recalls things getting out of hand during a Tallangatta and District league match at Holbrook in 1986. “Spot fights were going on all day, then a brawl erupted near the interchange bench and it was on,” he said. “Trainers and runners were involved, then a few spectators jumped the fence. “After the game a few had to go to the hospital and get stitched up. Good mates Neville Hensel and Ross Hillary, who coached Culcairn and Holbrook, were also known to defuse several tricky situations during their time at the helm. JINDERA wingman Ryan Speed is expecting Osborne to “double team” full-forward Trent Castles in Sunday’s elimination final at Walbundrie. Castles kicked 96 goals during the home and away series and is likely to have star backman Duncan McMaster dropping in front of him throughout the knockout final. He kicked four goals in both clashes during the season. “I think they will (double team),” he said. “In the last few weeks teams have done that. Castles will be hoping to become the second player in just over a week to bring up the 100-goal milestone after Henty’s Damian Cupido achieved the feat. The former Albury and Yackandandah player has previously bagged 100 goals in 2015 and 2017. Speed said Jindera were firmly focused on team goals rather than individual efforts ahead of Sunday’s match. ”We are going to have to put in a big four-quarter performance,” Speed said. “Obviously we’ve had some good tussles with them like in last year’s grand final and even this year. “Both sides are very competitive. Jindera defeated Osborne by seven points in round three before the reigning premier ran-out 32-point victors in round 13. 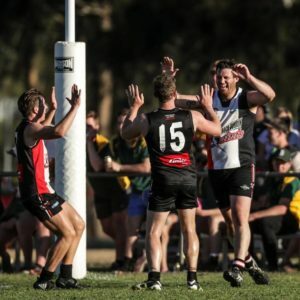 Holbrook take on Culcairn in the first elimination final at Walbundrie on Saturday. Has Walbundrie’s ground been in better shape to host a finals series? Not for a long time anyway. The surface has an even covering of grass with one official this week claiming “he couldn’t remember seeing it in better nick”. No clubs will train on the deck this week. One Hume league club appears to be closing in on a co-coaching arrangement for next season. With a big fish on the hook for 2019, the club looks to have all bases covered. Osborne is the only club with four football sides playing finals this season. It finished fourth in the seniors, third in the reserves, third in the under-17s and second in the under-14s. Holbrook, Jindera, Henty, Brock-Burrum and Rand-Walbundrie-Walla have three sides represented.